Soldiers from Company A, 2nd Battalion, 7th Infantry Regiment, 3rd Infantry Division, secure a Tigris River island during an island clearing mission north of Samarra, Iraq, on March 26, 2005. Deployed to: Iraq. The entire division returned home by the end of September 2003 but redeployed in January 2005 to relieve the 1st Cavalry Division in and around Baghdad. After a yearlong deployment, the division was relieved by the 4th Infantry Division in January 2006. Units: Since its first deployment to Iraq, the division has been expanded to include a fourth brigade, transforming into what the Army calls a "modular division." Each brigade is now a self-sustaining brigade combat team that can operate outside of the full division. During its second Iraq deployment, the division's headquarters commanded two brigades of the division and the 256th Infantry Brigade of the Louisiana National Guard. The other two brigades came under command of the 42nd Infantry Division. 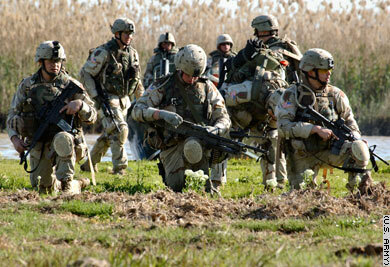 Duties: With its second deployment, the 3rd became the only Army division to have completed a second full tour in Iraq. It assumed responsibility for the Baghdad area on February 27, 2005, and conducted security and humanitarian missions while fending off insurgent attacks. During its second tour, the division lost 103 soldiers that were assigned or attached to the division before turning over its duties to the 4th Infantry Division. The 3rd Division is a highly mobile, rapid-response unit of the Army's XVIII Airborne Corps. Its weaponry includes the M1A1 Abrams battle tank, the M2A2 Bradley Fighting Vehicle and the AH-64 Apache attack helicopter. In March and April 2003, the division led the drive to Baghdad from the southwest and was the first to reach the Iraqi capital. Expected to return home after Saddam Hussein's government was toppled, the division instead remained to deal with the surge of anti-U.S. violence in Baghdad and central Iraq in the aftermath of the war. The division lost 33 soldiers before it was relieved by the 3rd Brigade of the 82nd Airborne Division and elements of the 82nd's headquarters in August and September 2003.